​My family love crepes, they love them filled with nutella or lemon and sugar or jam or nutella and strawberries, the list is endless. So for Valentine's day this year I found a recipe for red velvet crepes, tried them, and hated them. They were tough and quite ordinary. 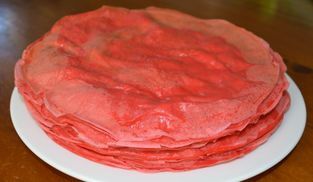 So a few days later I decided to make my crepe recipe but tint them red with a little food colouring, just for fun. 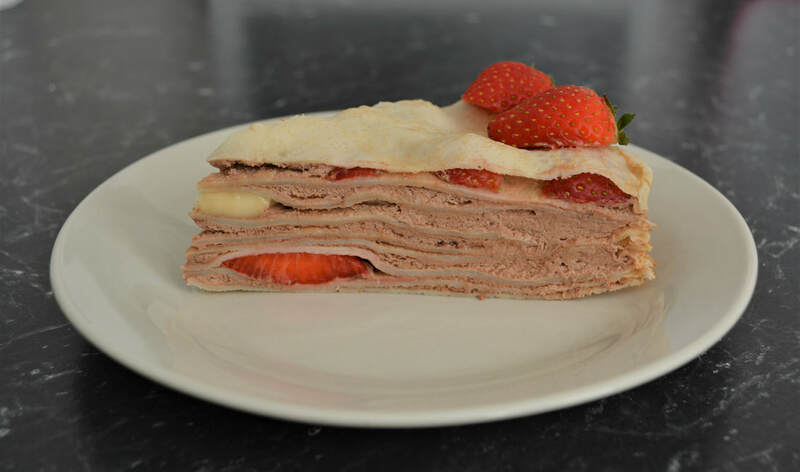 ​I also came up with this idea of making a crepe stack filled with Nutella mixed with cream and adding sliced strawberries. I had no idea if it would be good, but I figure it was worth trying. Once set in the refrigerator this is so good, absolutely delicious. I made this for my family first, they loved it, then I made normal crepes (not red ones) for guests, and they all loved them to. Once you get the hang of making crepes, you will never use a recipe again. As you can see my stacks are quite high, the recipe will not give you that many, but as my family love them so much, I always make extra. 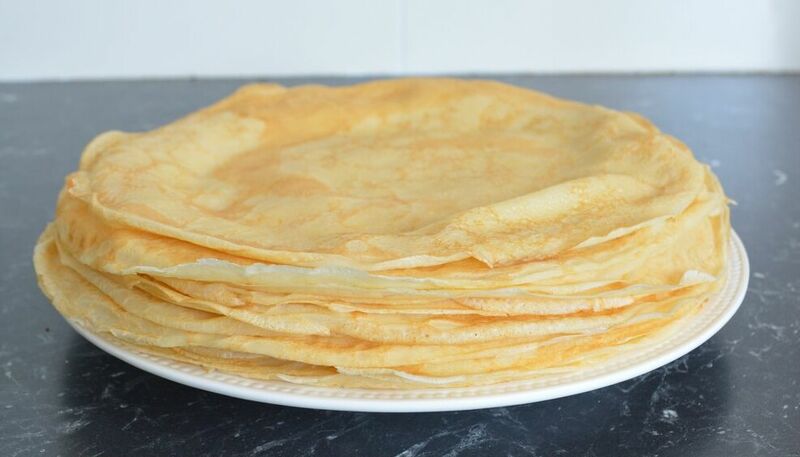 You will find a link to my crepe recipe below, you will need around 10 crepes. If you are new to crepe making, and some don't work, just make an extra batch. If some have a few holes in them, it doesn't matter. When you have made the crepes, you come back here and continue with the recipe. If you prefer you can use bananas instead of strawberries. Make the crepes following my recipe or use your own recipe, allow to cool completely. ​Halve 4-5 strawberries to decorate the top of the cake, leave stalks attached. Thinly slice the rest for the filling​, removing stalks. Beat whipped cream, until light and fluffy, be careful not to overbeat it. Place the nutella in a large bowl, add 1/3 of the whipped cream, gently fold the cream through the nutella to lighten it, as nutella is quite dense. Add the remaining whipped cream, and fold it all through gently. To assemble the stack: Place a crepe on a serving plate, spread with a thin coating of the nutella cream, top with another crepe, spread with another thin layer of nutella cream, this time place some sliced strawberry on top of the cream, not to completely cover the crepe, scattered the strawberry about. Repeat this process of crepe, nutella cream, crepe, nutella cream, then strawberry slices, until all your crepes are used up. 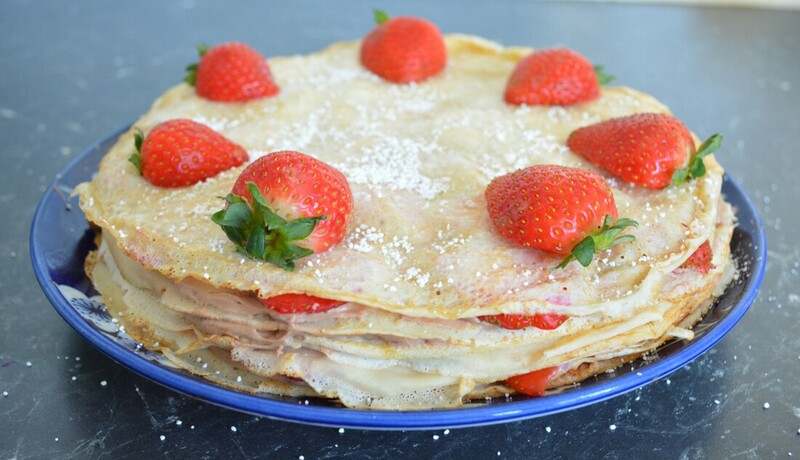 Strawberries get added to every second crepe layer, and as you scatter the strawberry each time, make sure you add strawberries to hollow bits so the crepe stack stays level. Cover with cling film, and refrigerate for at least 4 hours, overnight is good also. Thirty minutes before serving take it out of the refrigerator to allow the crepes to soften a little. Just before serving, decorate with some halved strawberries if you like, and a dusting of icing sugar.